As it turns out, not only do Simon Pegg, Edgar Wright, and Nick Frost love horror movies, but they love action movies too. And, although I suspect this is no surprise to anyone, they can bust out a pretty dynamite one of their own when they need to. For it is the great secret of all of their films that they parody what they parody not by existing above it but by emulating it, recreating it with an eye for detail and a studied approach, and in some cases reading it past itself to expose some of its silliness and lunacy. Thus is Hot Fuzz, not quite the genuine surprise that Shaun of the Dead proved to be (what, the guys who made one of the best comedies of the modern era made another comedy and it’s stupendous… consider me staggered). But it’s a genuine barn-burner nonetheless, firing on multiple overlapping comic cylinders and staking its claim as one of the few modern comedies for which the filmic arts – that is to say directing, editing, and the like – are as fundamental to the nature of the laughs as the writing and the acting. Say what you will about the similarities of their Three Flavours Cornetto trilogy (Shaun, Hot Fuzz, and the later The World’s End), but this unsuspecting crew of Brits doesn’t play to type all the time. Consider the way Pegg challenges himself by casting himself in the role of no-nonsense police officer Nicholas Angel, reassigned from the big city to a sleepy old town, with assumedly no crime, for the wonderfully droll reason that he is too competent and thus making all of his fellow officers look bad. There he meets Danny Butterman, another of Nick Frost’s patented buffoons, but only superficially the same character he played in Shaun of the Dead. While that lovable lug was at a loss for life, Butterman’s schtick is that he wants desperately to succeed, but doesn’t much know how to. Or what good decency and due diligence mean. 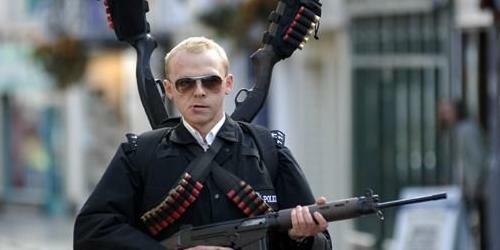 It would have been the easiest thing in the world to carve out a niche for Hot Fuzz as “Shaun of the Dead with guns”, but the character differences key us into a greater realization about the nature of the comedy in Hot Fuzz: they’re playing hard to get, and Hot Fuzz is most certainly not a retread of Shaun of the Dead. It’s bad (or good, considering their mutual desire for action) news for both of them then that the sleepy town of Sandford turns out to be a hot-bed of inconspicuous accidents. And that those accidents, each one mounting on the last, increasingly function more like murders. Certainly, however, it’s undeniably great news for us, the audience, who get to partake in some of the most spirited tomfoolery the cinema can offer (and some of the smarmiest Timothy Dalton this side of The Rocketeer). Even the nature of the comedy itself is a delectably confusing, contorted beast. On one hand, it’s a barbed dissection of action movie homoeroticism that leans heavily on the romantic chops the two leads (and writer-director Wright) developed in their previous collaboration. On another, it’s sly near-masterclass in modern-day screwball shenanigans that would be at home in some of the drier British ’40s comedies like Kind Hearts and Coronets. Still, another side is straight-up pure absurdism, such as a brilliant series of gags involving a statue accused of criminal activity. And of course, all of this is couched in a sterling exploration of the visual vocabulary of action filmmaking, at once genuinely exciting and mocking its own excitement, especially during a climactic shootout that is over-edited to all hell. Over-edited in exactly the way modern filmmakers tend to rely on over-editing as a crutch when genuine filmmaking would do just fine. Yet Hot Fuzz both exaggerates the haphazard editing to poke fun at it and somehow manages to elevate it by almost abstracting it to the point where we are paying attention to the edits rather than what is going on in the frame. Without ever truly conforming to one style, the madcap Hot Fuzz risks imploding on itself. But Wright and crew thrive off the energy, growing and gearing up for a slam-bang finale that exposes some of the more anarchic qualities of action cinema with a matter-of-factness and ingenuity that is startling at times. Yet that blunt trauma, that everyday matter-of-fact quality, was so important to what made Shaun of the Dead tick that it’s incredibly refreshing to see it expand to a further level and clash even more energetically with the lunacy thrown the film’s way. Especially in the first hour, when the film is in low-key mode, relatively speaking, a great deal of the humor applies the patented Shaun of the Dead lethargy in exciting new ways, primarily when the film tackles the police procedural genre and generally thrives on that same intersection of the everyday and the absurd that helped Shaun of the Dead ride across the finish line. So it’s a variation on a theme, then, but it’s not a repetition. The desire to loosen up at the heart of this film, for one, is the antithesis of Shaun of the Dead’s interest in growing up, and the gleeful off-the-deep-end spirit in the latter half of Hot Fuzz studies its high-flying genre so well it can’t but differ from Shaun’s grislier qualities. Still, a lot of what makes Hot Fuzz work is part and parcel with the “Pegg, Wright, Frost idea”, which is why each of their films is deservedly one part of a spiritual trilogy. They are all variations on the same themes, but Hot Fuzz tackles these themes with surprising nuance and feeling absent even Shaun. The hot-shot bravado of the stupendous action belies the earnest and thoughtful explication on the way grown men use the film genres of their adolescence to live in the world of over-baked nostalgia rather than actually address the realities of the world around them. Hot Fuzz is a furthering of this latent commentary on film becoming a safe-guard for the male imagination to retain its immaturity and construct its own false self-vision. But it is a commentary that is married to a genuine appreciation for the way these genres of film allow humans to escape from the real world in times of need, to set up walls for ourselves when life gets tough. It’s a shockingly well-developed undercurrent of not-quite-melancholy but something close to it, and it is always there propping up a generally kinetic rush of sensory overload. Even if it was just a dynamite little comedy with some extremely well-constructed action in the second-half (again, these guys know, and love, their genres, and Wright is again so obviously, infectiously excited to be directing an action movie he can’t contain himself), Hot Fuzz would be overflowing with pleasures both small and grand. That it is quite a bit more than a genre-parody, and that it is so much more than a wonderful genre-riff, owes to the way these three Brits understand people, and in particular understand the inner machinations of men of a certain age. They relate to these characters, but they aren’t afraid to critique them like old friends letting someone know what’s up, what they’ve found, and what they’ve lost. That is something that can work in any genre, but it is a little bit magical that these three postmodern poets work so hard to bring it into the genres that traditionally avoid such nuance and thoughtfulness altogether. This entry was posted in Friday Midnight, Review and tagged Action, British Cinema, edgar wright, is this a comedy?, nick frost, simon pegg on April 16, 2015 by jakewalters98.